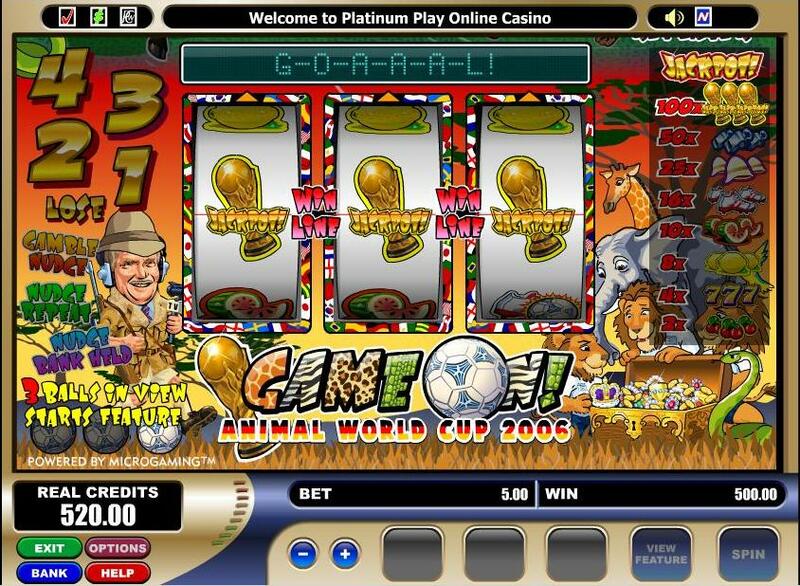 Nudge Gamble - This is a skill stop feature � which allows you to gamble up to 4 nudges. Stop the flashing nudges and either choose to gamble again or use the nudges. You must collect the nudges before using them. Nudge Repeat - This feature is activated when you use all your current nudges and the game gives a Nudge Repeat which gives you the same amount of nudges again. Nudge Bank Hold - This feature can be activated you chooses to spin without using all your nudges. The unused nudges are carried over to the next spin. Ladder Skill-Shot Feature - The ladder feature is activated by getting 3 overlaid football symbols on the reels. The ladder feature starts, the steps are flashed in sequence and you have to skill stop on one of 3 (randomly chosen) ladders and you will win the corresponding amount. Depending on which ladder you land - you could hit up to 100X, 250X or even 1000X your bet! And on top of all of that - if you are extra lucky you may even get the chance to repeat the feature, via a yes/no repeater skill stop once or even more than once! ANOTHER USEFUL HINT: If you fail to hit the top win on the ladder - quickly spin again and the next win or two often will make up for it! Sometimes you will even hit the feature again right away! This is the TOP JACKPOT possible on this game - 1000X the bet which in this case was 5 credits - 5000 WON! You can actually bet up to 10 credits a time on this game. A neat $5000 win for one lucky player at UK Casino Club where you can play this game for free or for real either in Instant No-Download (Flash) or the Download version of this great Casino Action group casino.